Your objective is to identify conflicting standpoints of the Pro-Removal Act and Anti-Removal Act parties. You will look at a variety of viewpoints and stances to demonstrate your knowledge on the topic. 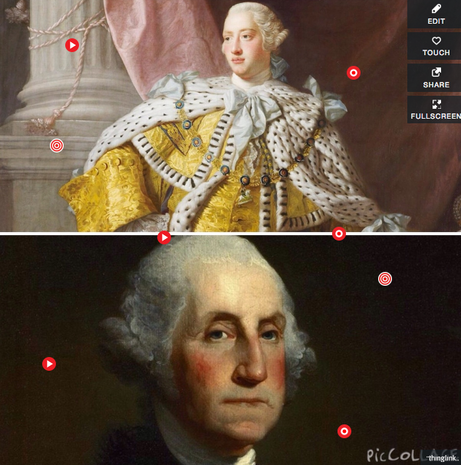 All of your hard work will be combined into one interactive image using Thinglink. However, all the different elements of your interactive image will be created separately. You will create this in pic collage. The following requirements allow you to use a variety of creation options. Remember that each requirement and each party must have it's own separate section. 3. Different perspectives within each party (1 for the Pro-Removal and 1 for the Anti-Removal). Here you will be expected to use a direct quote as evidence and analyze it! 4.. Conclusion: What happened at the end? How did each side react/feel about this? You can choose any of the tools below. Each is linked to a website that will further explain the app. *Remember--you need a written script for every requirement before you can begin video creation. You will add these into Thinglink directly as media uploads or links. Tools available for requirements 3, 4 & 5. * Export ALL video projects to your camera roll. * Type any text requirements in Google Docs. * If any of the videos you create are above 30 seconds--we will need to upload them into a Google Folder so they are sharable. Mrs. Sloan will walk you through how to do this later.